Thank you for your interest in joining the international family of ACS Athens representing more than 60 countries. 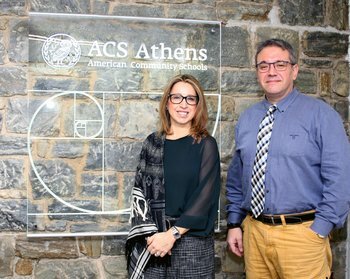 ACS Athens accepts applications throughout the academic year, from students who strive for academic excellence, based on the "best-fit" philosophy: capitalizing on each student's unique talents and abilities. Our Enrollment Management philosophy acknowledges the different cultural and educational backgrounds of our students; that's why we do our utmost to convey the message of international education to our prospective families by welcoming your visits to our school and offering insight to our unique and innovative educational system and its many choices through meetings with our counselors and academic leaders, when it is appropriate or necessary. Our admissions policy and processes, as described below, is reviewed and refined regularly, aiming to accept students based on their academic merit and a first-come-first-served basis. We encourage you to contact us via email at acs@acs.gr or call us at 30 210.6070.263, or 30 210.6070.251 with your questions about our programs, admission requirements, and the ways we can assist you in the application process. Any student officially withdrawn from ACS Athens for more than one semester, who wishes to return to the school, needs to re-apply for admission, by submitting all application-related documentation. All applicants entering 5th - 12th grades must take English and Math tests to qualify for admission. Tests are given in ACS Athens at regular dates or after special appointments or through a proctor at the student's current school (via special arrangement with our Admissions Office). Please note that a student has to submit an Application Form in order to take the Admission Test. Placement Testing in Math and English - if it is deemed necessary by the Counseling office for appropriate placement and course scheduling (Grades 6 - 12) after the student has successfully passed the Admissions Tests. NOTE to all Applicants: Please be informed that students coming from a non-American school can apply no later than 10th Grade. This includes candidates interested for the IB Diploma Program. Submit an Application Form for each applicant student with corresponding documents. A €60 non-refundable application fee must be paid upon submission. Arrange for Admissions Testing (Grades 5-12) or interview (Grades JK-4) - through the Admissions Office. If student passes the testing, submit remaining documentation required by the Application. The complete Application file is reviewed by the Admissions Committee. All responses (positive or negative) are communicated with the families through email. Placement testing is arranged (Grades 6-12) if deemed necessary by the Counseling Office. Its results will determine course scheduling and placement.